Training at dLab in Dar es Salaam conducted by Joseph Muhlhausen, WeRobotics. The business end of all drone mapping missions are actionable insights created by geographic information system (GIS) software. All year we have been chronicling drone use-cases from agriculture to land management planning. However, before any mission starts, the client’s expectations must be managed in terms of what the collected data will reveal in an area of interest. Thus the final product is an analyzed data set depicting such items as unhealthy crop parcels in a contiguous farm or the construction status of buildings for urban planning purposes. This explains why we launched the Drone Data Analysis course in Dar es Salaam on December 3-4, 2018, attended by Uganda and Kenya Flying Labs, along with a Government Land Officer and other participants from our last business incubation program. The objective of the training was to introduce GIS users and drone professionals to using GIS for analysing drone imagery. Over the two-day course, not only did the group extensively participate in manipulating and analyzing imagery, they also learned about advanced machine learning techniques that can be used for drone imagery analysis. Ultimately, the goal of the training was to understand how to go from image collection to an “actionable item” that helps make an impact. This training benefits any professional working with drone providers or drone professionals themselves. This course is a strong foundation for drone operators and GIS Specialists on how to interpret drone data, learn how to use geospatial software such as Quantum GIS and ArcGIS and how to share big data on GIS web hosting platforms with limited connectivity. Yet, the most important lesson is how to create an actionable item for the client. There are no exact or preset solutions for data driven decision making. Every client is different and every job is unique. Our training has the purpose to teach the use of appropriate GIS tools for the job. 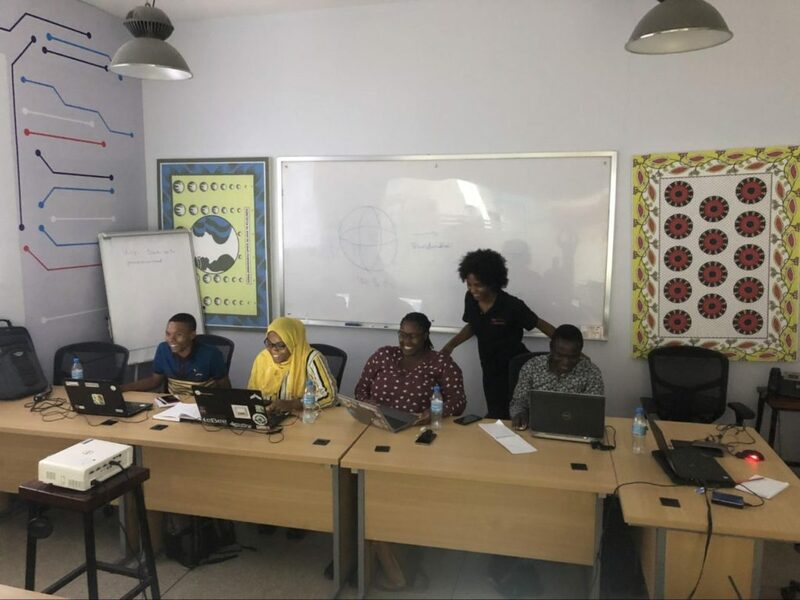 We wish to thank the Tanzania Data Lab for their first-class training rooms that made our course possible. Localizing expertise in geospatial analysis enables the scaling-up of fundamental programs such as land-use planning using drone data. Equally important, the growth of such programs creates professional and economic opportunities for local entities. Follow this link to enrol in our next course and join our community to receive updates on upcoming courses and events.